Most people want a bright smile, but not everyone has naturally white teeth. Discoloration may be due to genetics, insufficient oral hygiene, or eating and lifestyle habits that allow stains to build up over time. Patients in the Richmond, VA area trust holistic dentist, Dr. Olivia Hart, for healthy teeth cleaning and whitening. A clean mouth is the first step to a brighter smile. 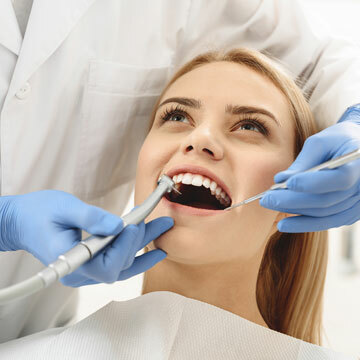 At Richmond Family Dentistry, a dental cleaning is a gentle experience. Our hygiene team doesn’t rush, taking as much time as necessary to remove bacterial plaque and hardened tartar – underlying causes of tooth decay and gum disease. Bear in mind that teeth cleaning cost is generally much more economical than the expense of dental work made necessary by these conditions. If an examination reveals signs of periodontal disease, Dr. Hart may recommend deep cleaning. This procedure involves cleaning and smoothing root surfaces, addressing diseased soft tissues, and sterilizing periodontal pockets. The goal is to reduce harmful bacterial populations and encourage a tight seal of gums to teeth. Professional teeth cleaning removes surface stains, including stubborn deposits between teeth. Maybe you would like an even whiter smile, though. At-home whitening with professional-grade FDA-approved products is a popular choice to remove superficial stains and enhance the smile quickly and easily. At the dental office, Dr. Hart fabricates trays that fit precisely over the arches of your teeth. Then you receive whitening gel that is used while wearing the trays at home. Depending on the severity of discoloration and the dentist's recommendations, you may be advised to wear the trays from a half hour per day to overnight, for the best results. Many patients report a marked improvement in the color of their enamel after just a few applications. Contact Dr. Olivia Hart of Richmond Family Dentistry about getting a brighter, whiter smile with our professional teeth cleaning and whitening services. Click here to make an appointment now or call (804) 381-6238 to learn more.